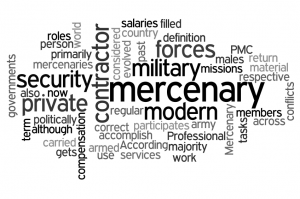 According to the modern definition, a mercenary is a person who participates in armed conflicts, and in return, he gets material compensation. (We say “he” because most of these tasks are carried out by males). Professional members of regular military forces are not considered mercenaries (although they also work for salaries). 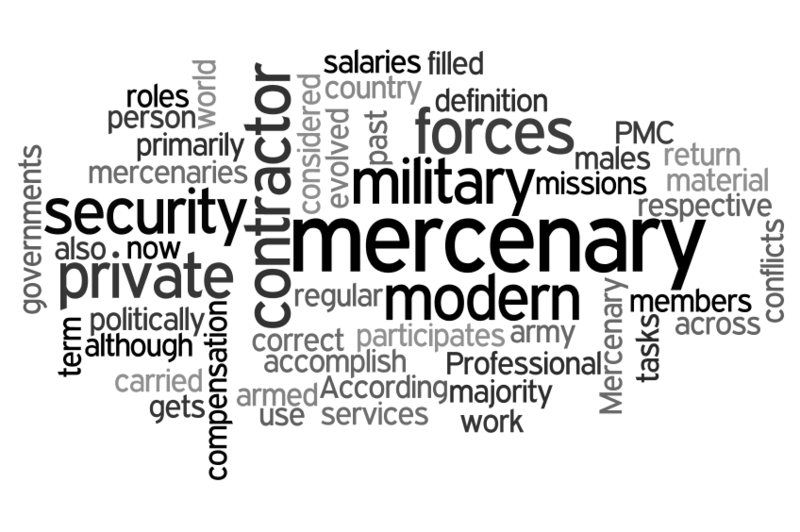 According to the Protocol I from 1977 (Additional to The Geneva Conventions), a mercenary is motivated to participate in armed conflicts by substantial material compensation (often much higher than the salary of regular soldiers of that country). The term “mercenary” can have negative connotations, because it is believed that mercenaries are always motivated by money. However, this can be said for many other types of professionals: clerks, hairdressers, butchers, traders and businessmen – they are all motivated by money. The difference between those jobs and mercenary jobs is that mercenaries often risk their lives for money. A mercenary is not a foreign volunteer. However, the distinction between these two terms is blurry. The French Foreign Legion can’t be considered mercenaries, because they are exempt from several clauses of the Protocol I; nevertheless, they are usually called “mercenaries”. Is there any difference between mercenaries and private military contractors? It seems that private military contractors are considered mercenaries, because their services are contracted; however, these people are subject to government regulations and they have to meet certain standards, in compliance with the international war law and laws of the country where the private military company is registered. On the other hand, mercenaries are never restricted by international war laws, and they are not forced to abide by government regulations. There are no “standards of conduct” for mercenaries. Anyone can hire mercenaries (there are no any restrictions). Sometimes, mercenaries can associate themselves to create resistance groups (this used to be very common in small, politically unstable countries). PM contractors can be civilians authorized to work with the army. That is why they are called “civilian” contractors. However, PM contractors can use armed force as well. Private paramilitary forces are considered mercenaries; these people are not advisors or guards. However, governments do have the right to control the nature, number and armaments of these armies. The majority of contractors come from discharged military personnel. During 1990s, more than six million people were discharged from military. How to become a mercenary? They found new job opportunities in private military companies. In some cases, entire units were transformed into PM companies. If this is what you want to do, you need to get some law enforcement or military experience. This means you should join the military and work there for a while. Joining special operation branches (security, explosives, intelligence, etc.) will help you get more experience needed for this type of job. After spending some time working for the military, you can apply to work for some of the private military companies. By this time, you will get enough experience. Before you make your decision, you should know that mercenary jobs always come with high risk: your life will be in danger! The salaries are high, but the risk of getting killed is high as well. Executive protection is basically a bodyguard service. Famous people often use such services. An executive protection job can offer you a great salary. Rich people are always willing to pay great deals of money to make sure their children get to and from school safely. They will also pay a lot of money for their own safety: they usually have several bodyguards. Soldiers must have medical care available at all times. This means that doctors have to follow the army to dangerous places. These doctors must have experience in military and they must be capable of providing medical help to soldiers in very tense situations. Companies like Academi are constantly looking for trained individuals who have military experience. These companies work with the government and send their own soldiers to various areas (including those in foreign countries) to perform all kinds of tasks. Generally, there’s not much difference between working for the federal military and working for a private military company. If things didn’t work out for you in the federal military or maybe you just didn’t want to commit for such a long period, the private sector might be the best choice for you. The job of a disaster officer is to protect people and assets such as power line trucks, medical vehicles and equipment, food, gasoline, and other important supplies in post-disaster areas. In case of an earthquake, tsunami, explosion, or medical disaster, companies will send trained personnel to address the situation and repair the damage. Their job is to secure the area and take care of supplies. Many retired soldiers work as law enforcement officers. They use their skills and knowledge to protect civilians. Military work is actually a form of crime prevention and law enforcement. Being a law enforcement officer isn’t much different.